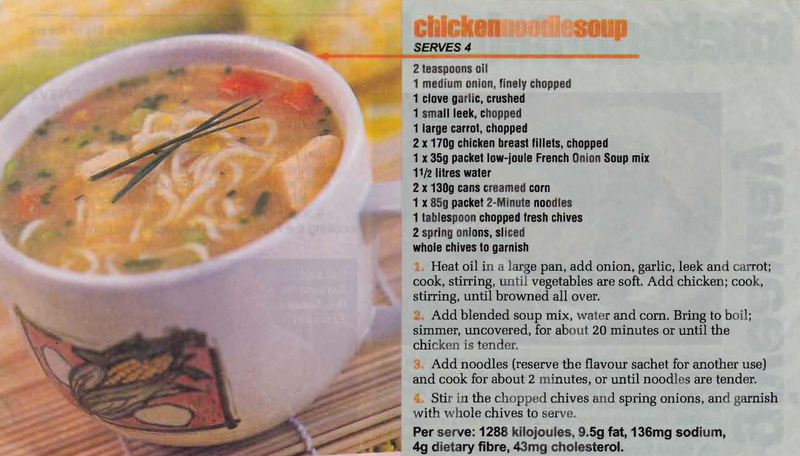 This is a low kilojoule recipe for Chicken Noodle Soup. I like that beside the chicken and noodles it also has carrot, leek, creamed corn and two types of onions. More than just a soup, more like a meal in a bowl. This entry was posted in All Recipes, Soups & Starters and tagged 1990s, carrot, chicken, chicken noodle soup, creamed corn, garlic, leek, noodles, onion, onions, spring onions by bebsrecipes. Bookmark the permalink.